Improve your product development success ratio! This IFT Basic Symposium is the collective work of a team of seasoned food industry consultants whose experiences and observations provide a "how to" guide of successful product and process development. Their information-packed presentations will deepen and broaden the food technologist's knowledge of food product development to the sphere beyond the laboratory. 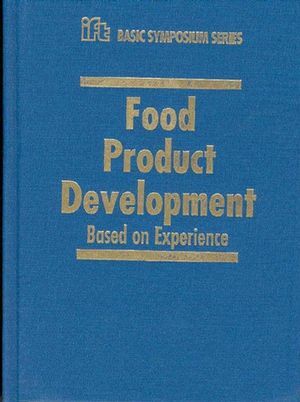 A case study and several short case history lessons illuminate product development from perspectives that include consumer and marketing needs, manufacturing ramifications, communication issues, food safety systems, shelf life techniques, and distribution elements. Catherine Side is the editor of Food Product Development: Based on Experience, published by Wiley. 2 Focusing on the Participants: When and How To Involve Them. 3 Managing the Product Development Process. 4 Organizing Human Resouces: By Project? By Discipline? As a Matrix? 5 Product Life Cycle: Consumer and Market Research. 6 Shelf Life Considerations and Techniques. 7 Product and Concept Testing: Methods and Cost Control. 8 Case Study: Introducing a New Flavor and Color Ingredient. 9 Food Safety Systems: Anticipating Production and Integration into the Process. 10 Some Lesson Vignettes from Focus Groups and Other Market Research. 11 Equipment Integration in the Process: Patent Questions and Vendor Confidentiality. 12 The Role of Food Packaging in Product Development. 13 Contract Packaging ot In-House Manufacturing? 14 Initial and Progressive Cost Estimates. "This is one of the IFT Basic Symposium Series. The 198 pages, in 14 chapters, were written by eight experts - new product development giants. * "How to" guide of successful product and process development.